On growing up, after gaining education and finding a job, I will get married and look after my family. I will provide higher education to my children. Then they will get jobs. Then we will marry them off. God will grant kids to our children. Then our duty will be over. Many times, elderly people of the village and the neighbouring village used to gather together and ask about each other’s well-being. One of them said, “By God’s grace, I have two sons and two daughters. I toiled to bring them up and educated them. Now I have married them off. All of them have sons and daughters. My task has been accomplished. I have turned 75. Now I can die; my life has been successful. The family line has commenced; my name will remain in the world. Interpretation: - Whatever was obtained in the above-mentioned account was pre-determined in the fate. Nothing new was obtained. A man got married, and had a daughter. It has been a belief of the human society that if one does not have a son, his clan does not propagate. (But from the viewpoint of spiritual knowledge, there is no difference between a son and a daughter.) He hoped that the next child would be a son. The second was also a daughter. Then he hoped that on the third occasion, God will grant him a son. The third was also a daughter. In this way, he had five daughters. He never had a son. It is clear from this example that neither one gets what one wishes for, nor what one does. Whatever happened was destined to happen. This is God’s rule. A human being in the present life should take initiation from a Complete Saint and do bhakti. He should also definitely perform charity, religious and meritorious deeds; otherwise, finishing the fruits of the auspicious deeds of previous lives, he will go empty-handed to God’s court. Then he will have to suffer in the lives of animals etc. Like, a farmer sows wheat, chickpeas etc in his field. Then after working hard and making them mature, he brings them home and stocks them in his storeroom. If he does not sow the seeds again and prepare a crop, and is only eating the wheat and chickpeas from the previous year, then currently he will not face any problem because the wheat and the chickpeas from the previous year are still remaining, but one day those already stored grains will finish and that family of the farmer will become poor. In a similar manner, whatever is being obtained in the human life is a collection of the previous lives. If one does not do bhakti and auspicious deeds in the present time, then the future life will become hell. After gaining spiritual knowledge, a man like a wise farmer will sow the crop of charity, meritorious deeds and recitation of mantra every year in every season, and will consume it after storing it in his house, and will also sustain himself by selling it, that is, after taking initiation from a Complete Guru, he will collect his wealth of bhakti by doing worship and charity in every Samagam as told the Guru ji. Therefore, a Supreme Saint teaches the way of life to a human being. It is based on the true spiritual knowledge that is certified by all the holy scriptures. Like, in the aforesaid account, an elderly person said, “Raising all my children, I have married them off. The aim of my human life has been fulfilled; my life has become successful. Now I do not mind dying.” It is a point to consider that he has only spent whatever was previously accumulated. He has done nothing for the future. As a result of which, his human life has been wasted. Meaning: - If a person wants to maintain his family line forever through a son, then it is his misconception. Like, King Ravan of Sri Lanka had one lakh sons and one lakh twenty-five thousand grandsons. Currently, there is not even a single person of his family (lineage) to even light a lamp at home. All got killed. Therefore, O Man! What is this that you ask from God that is not even permanent? This desire arose due to lack of spiritual knowledge. God gives you whatever is in your fate. Nothing is happening as a result of your efforts. If we believe that old man’s statement that by having a son, one’s family line propagates and one’s name remains in the world. In a village, initially there were only four-five people. Hundreds of families have been formed from their descendents. Their family line is continuing. Their name is also continuing in the world. But because of not doing bhakti according to the method mentioned in the holy scriptures, according to God’s rule that gentleman may be suffering somewhere in the life of a donkey. By propagating the clan of donkey there, then he will take birth as a dog. Then by propagating that clan, he will take birth in the lives of other creatures and suffer for infinite births. The import is that a person in human life, while doing worldly tasks, should also perform task of self-welfare. As a result of which the blows of previous sins about to befall the family will also be averted. The family will remain prosperous. Otherwise, due to the results of both good and bad deeds, one has to intermittently bear the havoc of happiness and sorrows. Once, this Das (author) was doing a three-day Satsang-Paath (Spiritual Discourse + Recitation of a Holy Book) in a village. A relative of that very family brought a four years old boy with him. During a conversation, he said, “I had four sons and two daughters. I married them all off. Perhaps, there was no one as happy as me in the village. Then things reached such a pass that within two years my family got ruined. Two sons were going on their motorcycle to their in-laws. They died in an accident. Their wives got married in other villages. A year later, at night another son got stung by a snake on the tube well in the field. He was found dead. Due to this tragedy, the fourth son died from heart attack. All the daughter-in-laws also left home. My wife became mentally disturbed. This is my eldest daughter’s son. I am passing my days with him. I have kept my daughter at home.” It is a request to the dear readers that act with discretion and acquire the true path of human life. Definitely do Bhakti. “For some days, he stayed with his eldest son. But only after six months, his clothes started to smell. Then he stayed with the third son at his place. After a few days, he also gave up. In this way, all the four sons got frustrated with looking after him. The Panchayat (village council), with the motive of getting my father-in-law looked after, decided to give two more acres of land to that son who would serve him. Lured by this, the youngest son accepted to take care of him. After six months, he said that it is not my cup of tea. The relatives gathered. They counselled all the children in every way, but nobody got ready to take care of him.” That devotee was saying that – ‘My father-in-law could not even speak. When his young grandson came in front of him, then by moving his neck he indicated that – “Come to me, I will give you a cuddle.” This is the misconception. Sons have brought laurels and now grandchildren are pending! A servant was kept for him by giving those two acres of land on contract, and he had a terrible death. Just think that even if such a hardworking person had this knowledge that without bhakti and meritorious deeds, a human life becomes hell, then at least along with that he would have also done Bhakti of God and would not have suffered such a plight. His children would have also served him. These very teachings are given in satsang. Devotees are taught the lesson of kindness and meritorious deeds. During a satsang, elderly people, people who are ill, disabled, women with small children, sisters and daughters come to the ashram. Male and female devotees are delegated in the ashram to look after the visiting elderly people, the sick and other helpless people. They give them a bath, wash their clothes, and bringing blessed food from the kitchen, they feed them in the hall (Pandal) itself where they are sitting. They serve them tea and milk at their place. Just think that those children (who go to satsang) and daughters, sisters, mothers and devotee brothers, who serve the unrelated people coming to the satsang, will serve their own parents, brother-sister, father and mother-in-law in their homes with the same attitude, because it becomes their nature. They are filled with compassion in their hearts. They thoroughly know the rule of God. In the previous topic about the hard-working farmer who suffered from stroke and got ignored by his children, if those sons and daughter-in-laws had been attending the satsang, they would have taken a lot of care of their father. If that farmer had done bhakti of God, his body would have remained healthy and due to his bhakti, impressed by the splendour of the worship performed by him, his family would have automatically respected him. For example, sadhu-saints only do bhakti. As a result of which, the entire village serves and respects them. Likewise, because of doing bhakti, the power of God automatically inspires others and makes favourable circumstances for the devotee. That is why, saints urge to do bhakti. The way of life becomes good through Satsang. 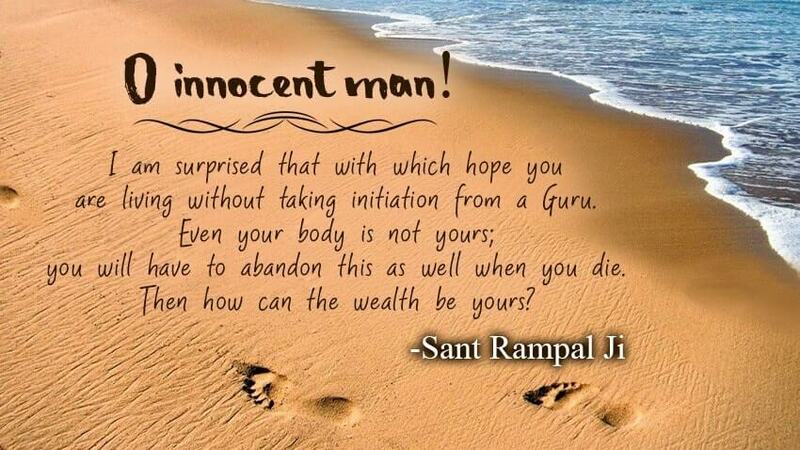 Meaning: - God Kabir is saying that – O innocent man! I am surprised that with which hope you are living without taking initiation from a Guru. Even your body is not yours; you will have to abandon this as well when you die. Then how can the wealth be yours? Meaning: - In olden days, there were no jeeps, cars etc vehicles in the police stations. When the police had to raid a place, they forcefully used to get hold of a private three-wheeler or a four-wheeler owner, and sitting in his vehicle (three-wheeler or four-wheeler) used to take it wherever they wanted. The driver used to be the owner of the three-wheeler and he only used to pay for the petrol or diesel. He did not even use to earn his livelihood that day. The police used to make him drive here and there all day. A common man used to think that this three-wheeler driver will earn a lot of money today; he has driven the whole day. But only the driver used to know what had happened to him that day. He did “begaar” (full effort, no outcome). Similarly, the kings instead of doing bhakti in this birth are finishing their lives only in the maintenance of their kingdoms, so they are doing “begaar”. One becomes a king as a result of the meritorious deeds performed in the previous life. He is consuming the fruits of those meritorious deeds in this current life. The public thinks that the king is enjoying himself. From the spiritual point of view, he is doing “Begaar”. He is not doing bhakti. If a person does not do bhakti by taking initiation from a complete guru, then even if he gets a kingdom of the land between the sun-rise and the sun-set, that is, of the entire world, he is still making a futile effort like that three-wheeler owner. He will gain nothing. Therefore, whether it is the king or the public, rich or the poor, everybody should do bhakti afresh. Only bhakti will make their future bright. Translation of Speech: - By making soul and (man) mind as characters, Sant Garibdas ji has advised the human being of the world. He has said that “This world is an abode of sorrows. There is another world separate to this where there is no misery. That place is (Eternal Supreme Abode = Satyalok), and the God there (Immortal Supreme God) is the ocean of happiness.